In the mid 1970’s, I had a short stint as an art student in Wisconsin. Through those studies I met the remarkable professor, Reinhold Marxhausen, who was skillful at teaching others to see. Like the more recent work of Dewitt Jones, Marxhausen embodied a calling to help others discern unexpected beauty in everyday places and people. The vocation of the artist is to see and help make apparent the beauty that surrounds us. Theologians have the same vocation. For artists and theologians share an interest in beauty, goodness and truth, and their common divine source. A saying from the early Egyptian Christian monk, Evagrius, may help us here. He said that a theologian is someone who prays. Someone who prays acquires logos about theos. He or she gains wisdom from God and, in the process, receives a fuller vision of beauty, goodness and truth. On Sunday, we will hear one of my favorite Gospel stories ~ the road to Emmaus. This story prompts an Eastertide question, of interest to both the artist and the theologian: Where do we find the resurrection? In what unexpected places or people do we find the risen Jesus? The inverse question is more perceptive: Where does the resurrection find us? In what quite unexpected place or part of our lives are we found by the risen Jesus? Encountering and then seeing true beauty, we find our hearts burning within us. 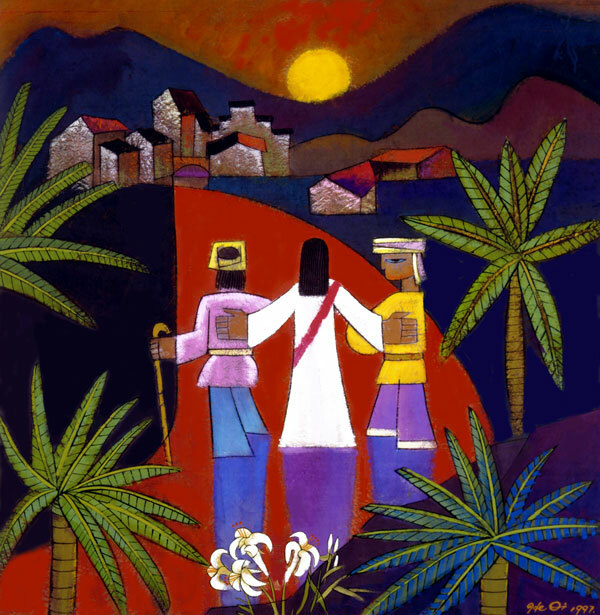 The painting, The Road to Emmaus (1997), by He Qi (He Qi,© 2013), is used by licensed permission. The Emmaus story can be found in Luke 24:13-35. * This is the evocative subtitle of the commendable book, The Jesus Storybook Bible (Zondervan). As a Christian artist I have learned to view the calling as something of a prophetic one; revealing the heart and mind of God in and to a world that would otherwise not have noticed the beauty with which He has favored us. In this sense the calling is more akin to the calling of the priest; that of standing with one foot here and one foot in the heavenlies, joining the hand of God whose desire it is to make humanity whole and the hand of a broken humanity not yet willing to receive the fullness of the beauty of what it means to be fully human.